1.I am indeed happy to be a part of this Presentation Ceremony of the Eighth National Presidential Biennial Award for Grassroots Innovations and Outstanding Traditional Knowledge. At the outset, let me congratulate all the award winners for their work and contribution in the field of innovation. I take this opportunity to also compliment the National Innovation Foundation (NIF) - India for unleashing the creative potential of the grassroots innovators and for championing the cause of inclusive innovation through its various initiatives. In particular, I would like to place on record my high appreciation for the outstanding contribution of Prof. Mashelkar and Prof. Anil Gupta in making innovation take the shape of a movement in our country. 2.Innovation is the key to progress and prosperity. There are many social needs that public, private and civil society institutions have not been able to meet fully. At the same time, there is tremendous ingenuity amongst the people, which if tapped, could address the necessities of the common man. Much as the blooming of the spring, the innovations by local communities, students, farmers and others could bring smiles on the faces of millions of our people. 3.The process of innovation converts knowledge into social good and economic wealth. It encourages the engagement of talent with the society to improve the quality of life. India always has had a strong tradition of knowledge. Our knowledge system offer tremendous scope for research involving land-to-lab investigation and lab-to-land transfer of technology. It is important that the vast repository of indigenous knowledge is protected, documented and preserved in active collaboration with prominent practitioners of traditional knowledge. 4.Inclusive development is possible only when ideas and innovations of common people are supported whole-heartedly. Mid-way through this Decade (2010-20) of Innovations, we perhaps need to assess and if necessary recalibrate our approach towards harnessing the creativity of our grassroots innovators and students. Increasing the scalability of grassroots innovations necessitates a strong linkage between the invaluable knowledge bank prevalent in our society and the formal education system. To use our innovation potential for the greater good, the nodal governmental agencies must play an enabling role. 5.Building viable linkages between formal and informal sectors also call for deepening the involvement of the leaders of technological, financial and educational sectors with the creativity of common people and young students. 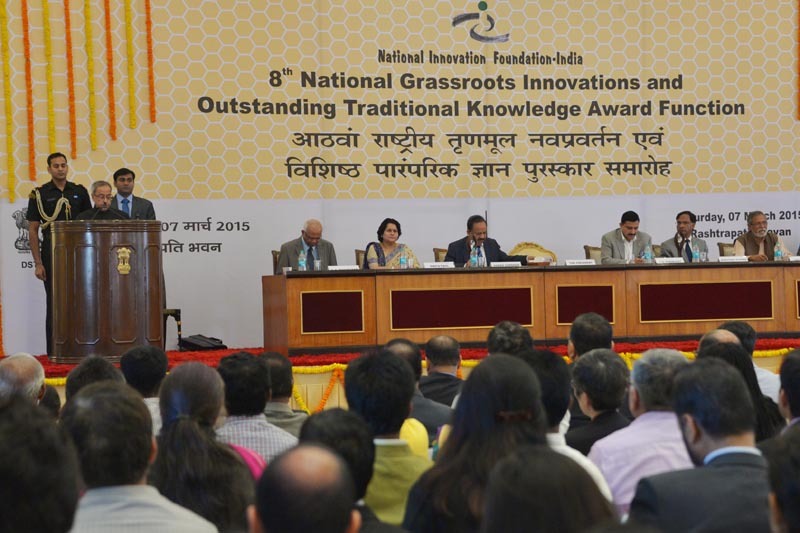 A Festival of Innovation has been started at the Rashtrapati Bhavan this year. It will help to provide a platform to bring different stakeholders together and make these entities active partners in inclusive innovation. The innovators participating in this programme have come from various parts of our country. I hope that an empathetic value chain for disseminating good ideas can be built upon this initiative. 6.I am told that the Innovation Exhibition will showcase novel solutions to problems in multiple domains such as engineering, agriculture, health and other socio-economic sectors. These innovations are aimed at improving productivity and efficiency, and enhancing affordability and environmental quality. They provide a veritable impetus to the ‘Make in India’ mission in our country. Apart from developing appropriate linkages with investors, entrepreneurs and financial institutions, the Union and State governments should also consider taking up these innovations for wider diffusion through their administrative channels, particularly in economically backward regions, and tribal and remote areas. 7.In this context, it is only appropriate that agricultural universities, public sector R&D laboratories, IITs and NITs are supporting the NIF in validating and value-adding grassroots technologies. Even then, NIF faces a potent challenge in scouting more women innovators and outstanding traditional knowledge holders. I am sure that with sustained effort, NIF will overcome these hurdles. Greater involvement of crucial stakeholders will provide the stimulus required for inclusive growth and development. 8.India has the potential to be at the forefront of innovation. The encouraging steps in this direction notwithstanding, our country lags behind many others. India is ranked 76thin the Global Innovation Index 2014, much below China which is at the 29thposition. Even Russia, at the 49th place and Brazil at 61, performed better than us. 9.The contribution of grassroots innovators and innovations by the MSME and the informal sector are considerable in our country. Yet, there are lessons to be learnt from others and experiences to be shared with countries and organizations, which have taken the lead in the field of inclusive innovation. I am glad to learn that this pertinent topic - inclusive innovations - will be the subject of round-table discussions today and tomorrow. I look forward to the summary of the deliberations today evening and I hope that the discussions with delegates from various countries will help India take this agenda forward. 10. Through the conferences of vice chancellors of central universities and of directors of IITs and NITs, I have been urging our higher educational institutions to set up Innovation Clubs. These clubs are intended to be a platform for exchange of innovative ideas between the teaching and student communities, and grassroots innovators. These clubs are expected to sense the unmet social needs, and search, spread and celebrate grassroots innovations. Once these unmet needs are mapped, our pedagogy and research process could be reoriented suitably. The representatives of Innovation Clubs will meet here during this week to discuss their achievements and future strategies. This Festival will provide a forum to the faculty and student representatives to learn from the grassroots innovators about frugal and sustainable innovations. 11. To promote and nurture the creative potential of our people, the Rashtrapati Bhavan has been opened for innovation scholars, writers, artists, scholars from NITs and inspired teachers. Today, the second batch of innovation scholars, writers and artists have joined us here for the In-Residence Programme. I welcome all of them to the Rashtrapati Bhavan. I hope that this Festival of Innovations will create synergy amongst these creative people. "Concern for man and his fate must always form the chief interest of all technical endeavors. Never forget this in the midst of diagrams and equations”.